Truth be told I felt a bit sad leaving Cornwall. I felt great there and I knew for sure that I missed many great places but I have already booked my next accommodation and with a tank full of gas I started towards Weymouth. However since I’m always curious and want to see many places I stopped along the way on some little spots, resting, watching the scenery, taking photos and just slowing down and unwinding. After 70 kilometers I made my first short stop in a little place called Mevagissey. On this location I roamed the streets a bit and headed towards the harbor to enjoy the view. One thing I will always love is places that have harbors, boats, where the sea meats the land. Most of the places I love and loved visiting are port cities. They just have a special vibe in my opinion and each time I visit a new place like this I am excited. 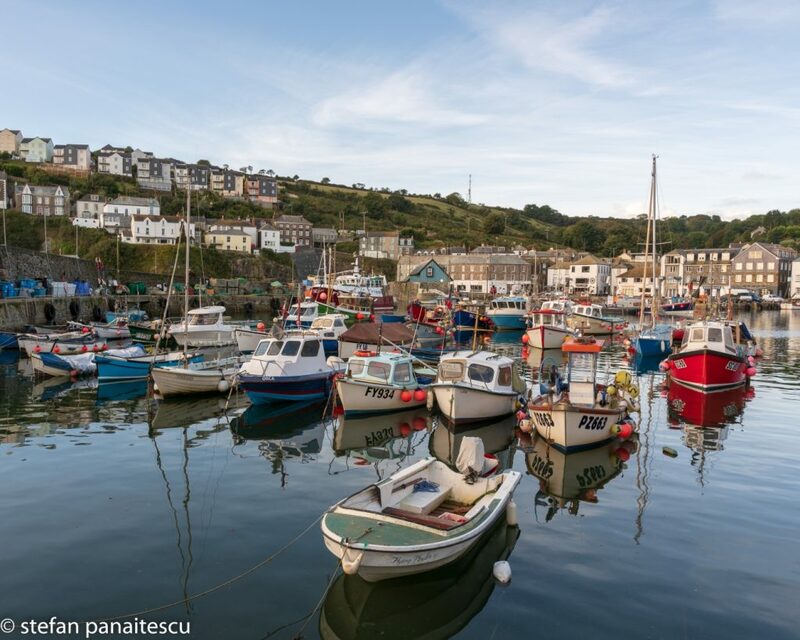 I haven’t spent a lot of time in Mevagissey but if you’re in the area you could check it out. I really enjoyed the harbor, the boats, sitting down and watching the people start their morning. I was there so early that most of the shops were not even open yet. In a way it felt like the whole place was mine. A couple of fishermen and another couple taking pictures and that was it. Quiet morning in this little harbor. The parking was OK with 2.5 pounds for two hours, time in which you can walk relaxed in this place and enjoy it. Another 50 kilometers more and enter Polperro. First things first outside the town there’s a big parking lot where all vehicles are held. Pay the price at the special machines and then head into town. From the start I must tell you that I loved Polperro. 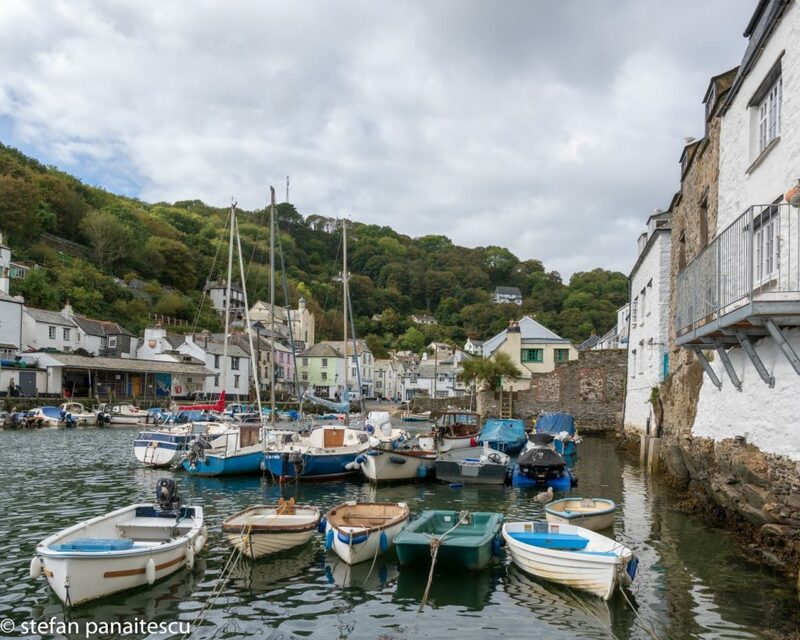 From the parking lot to the town you will walk for about 600-700 meters then…Polperro. Small, beautiful streets. Check. Colored houses. Check. Flowers everywhere. Check also. And a beautiful harbor filled with boats. Super checked. Even though I visited a lot of towns and small ports in my UK trip I must confess that Polperro is to this day one of my favorites. It has something special and I think my pictures do this place no justice. Even better because I urge you, if visiting this part of England, not to miss this place. Spent a bit of time in Polperro. After admiring and walking on the streets and spending time in the harbor I started photographing it then I just sat on a bench and watched the place. Best parts in my trips are the parts where I know I don’t need to rush. Where I’m calm and relaxed. Since it was noon I looked around Polperro and decided upon a place to eat. This place will be reviewed in a later article as always. Now, the reason why I don’t spend much time detailing things in these places is simple. My memory is not great on this day and I’m not sure if I said this before but here it goes. I stopped writing long reviews because I think pictures tell more. Maybe you don’t have enough time to read two pages about each place I visited and maybe you’re not even interested on those places. Maybe you can’t understand my excitement sometimes because you weren’t there with me to feel those things. So I think pictures serve me better. That’s why I constantly look to study, to practice, to take better pictures. Because most of the times a picture can say more than a thousand words can. But returning to the post I urge you to visit this place. Polperro is a special little place and I am sure you won’t be disappointed. 185 kilometers later enter West Bay. My first meet with the famous Jurassic Coast. And it was better than I hoped for. You see, before reaching the UK I have studied, looked for interesting places, pictures, etc and even though some pictures I saw were beautiful nothing can prepare you for the real thing. I parked near the start of the cliff and walked for about 200 meters then just stopped and marveled. 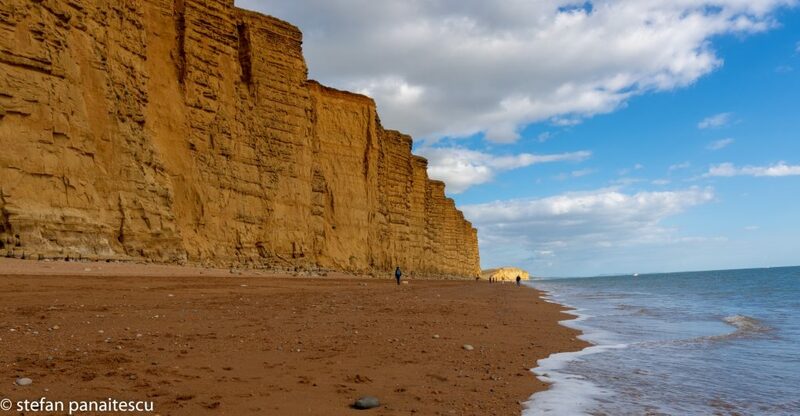 And Dorset’s Jurassic Coast is a place where you will be amazed often. Starting right here in West Bay where you can walk on the beach, on one side having the sea, on the other side a huge cliff. After driving more than 300 kilometers I was happy to sit on a rock and just relax. The hard part of the day was behind me and I only had about 30 kilometers left until Weymouth. Now I won’t speak much about Weymouth because while a nice, decent place I found nothing special there. I found the whole place a bit too touristy but I think that’s understandable since it has a huge beach and many places to swim and have water related activities. After checking in (review coming up next) I took a shower and headed towards my final destination for that day. Portland bay with two major sights: Portland Bill and Pulpit Rock. Not far from Weymouth, about 11-13 kilometers away, this is a place best visited at sunset. You can leave the park at the big parking lot near Portland Bill then explore the area. Truth be told you can see the entire place in 30 minutes because Portland Bill is an old lighthouse and Pulpit Rock is a rock formation very close by. 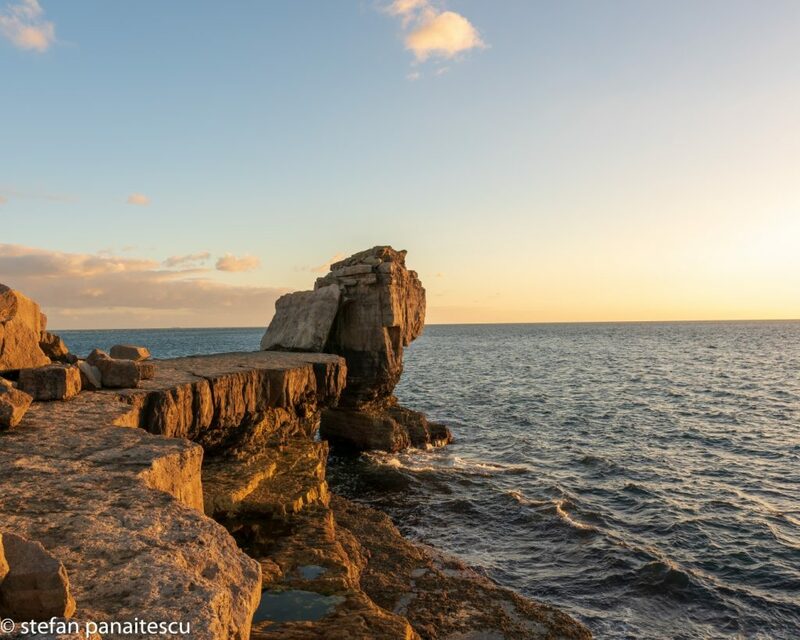 Nonetheless I encourage you to visit this area at sunset because I am sure you will enjoy the sun going down over the sea, the rocks catching a special color. The picture bellow is taken there and it’s one of my favorite pictures from this trip. I stood there relaxing for about 30-40 minutes, leaning on a rock and resting after a long day and a long drive. Small scenic harbors, the Jurassic Coast, a long drive, Pulpit Rock, all in a day. It may sound a tiresome and in a way it was but it was also beautiful. My next articles will focus on eating in St Ives and another small Cornish restaurant, my accommodation in Weymouth and my route thru Dorset on the second day. Later on we will touch other subjects as my journey thru England continues. Between articles you can always check my Instagram account for new pictures from all my trips.